Fans of Resident Evil who enjoy the video game will love being enveloped once again in the game through this latest release. The action, graphics and story are good enough to be included in the franchise. And if you include yourself in that grouping then you should definitely invest in the 4K version. Resident Evil (originally titled Biohazard) debuted as a PlayStation video game in 1996 and for 21 years it has entertained gamers and audiences worldwide. There have been numerous version of the extremely popular game and it spawned a motion picture franchise starring Milla Jovovich (The Fifth Element). Unlike the live action films, the game and animated movies follow Chris Redfield (Kevin Dorman; Real Steel) as he fights the Umbrella Corporation and evil company that developed the T-Virus. The deadly virus transforms humans into zombies and creates horrifying, mutant monsters from other creatures. In the latest installment of the stop motion animation, Resident Evil: Vendetta, we meet Glenn Arias (Jogn DeMita; Princess Mononoke) a deadly merchant who wants revenge on the U.S. Government. Years earlier Arias' wedding day was bombed by the government and, while he survived the attack, his wife and family did not and his best friend Diego was disfigured. Arias eventually makes Diego into a hideous monster and killing machine assisting Arias with his plans. In his quest for vengeance, Arias kidnaps BSAA informant Cathy White and her son Zack and when Redfield and team go to save them he finds they have been turned into zombies causing Redfield to proclaim revenge of his own. Meanwhile, Arias attacks a University Mansion where former S.T.A.R.S. member Rebecca Chambers (Erin Cahill; The Watcher) works as a scientist. It seems Chambers has researched the A-virus (a new version of the T-Virus) and found an antidote which spoils Arias' plan to launch a massive attack on New York City and turn everyone into zombies. Chambers and Redfield also team up with Leon S. Kennedy (Matthew Mercer; Critical Role), a zombie expert, who reluctantly helps the team in attempts to foil Arias' plan. This third CG film was written by Makoto Fukami (Psycho-Pass), and Joe McClean (The Drama Club) and is directed by Takanori Tsujimoto (Monster Killer). While the basic premise is the same, the plot adds a few new points that keep things interesting. Rebecca's reappearance after a 15-year absence should trigger a little bit of nostalgia for fans who have been around since the beginning. Tsujimoto also adds some terrific elements like the Diego/Arias morphed monster that is the stuff of nightmares. 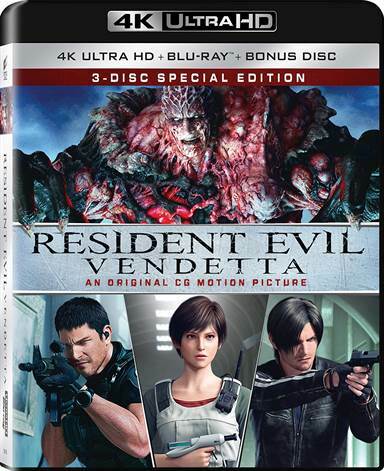 Resident Evil: Vendetta is offered in a 4k, Blu-ray and bonus disc three pack. The video is HEVC/ H.265 with a 1.78:1 aspect ratio and the picture quality reflects the advanced technology. The pictures are extremely details especially when Ariego monster attacks. The blood splatter is also graphic as are the zombies. The Dolby Atmos audio is spectacular with the dialogue sitting nicely in the center channel. The special effects are dedicated to the surrounding channels and completely immerse the viewer in the film. The extras are on both the Blu-ray and the bonus disc. The first disc includes the film, stills gallery, audio commentary, motion capture set tour with Dante Carver, who previously did motion capture and two featurettes which are "CGI to Reality: The Creature" and "CGI to Reality: Designing Vendetta." The second disc includes two featurettes which are "Designing the World of Vendetta" and "BSAA Mission Briefing: Combat Arias." and the Tokyo Game Show Footage. For anyone who has an interest in graphic design, the CGI extras will be especially informative. Fans who enjoy the video game will love being enveloped once again in the game through this latest release. The action, graphics, and story are good enough to be included in the franchise. And if you include yourself in that grouping then you should definitely invest in the 4K version. Download Resident Evil: Vendetta from the iTunes Store in Digial HD. For more information about Resident Evil: Vendetta visit the FlickDirect Movie Database.